For years, I've searched high and low for the perfect red nail polish. Some were too crimson, others too scarlet. Some were too glittery, others too matte. But my prayers have been answered in the form of NARS Rouge Andalou Nail Polish. Part of the NARS Holiday 2009 Collection, this polish is a gorgeously rich candy apple red that just exudes sultriness and sexiness. It has a glimmery jelly finish and flows ever so beautifully onto the nail. The color is so rich, it's simply perfect for holiday parties -- or an important date with a handsome fella! And after four days? I've experienced minimal tipwear and chipping, even after hours upon hours of typing and opening up box after box. I've seriously never found this to be the case with any red polish I've tried -- so I'm completely enamored, of course. 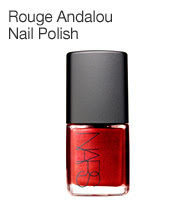 NARS Rouge Andalou Nail Polish retails for $16.